I watch a lot of Star Trek. I love that show—in all of its forms. I know I’ve said it before that I’d rather watch an episode of Star Trek then pretty much any other TV show out there. That’s why I was glad when “Star Trek: Enterprise” was renewed for a fourth season. It’s also why I love the fact that you can get every episode of every show (nearly) on DVD now. Ok, so they’re about half-way through the “Voyager” release schedule and “Enterprise” hasn’t started to show up yet. Still it’s pretty awesome for Trek fans. I’ve been making my way through season 3 of “The Next Generation” recently, and tonight I hit the episode. There are many good ones from that season and of course many would point to the Borg-intensive season finale “The Best of Both Worlds” as the point at which the series got really good. But for me, the episode is “Yesterday’s Enterprise”. Yes, it is a “reset switch” episode where the hackneyed “it was all just a dream” story point is resolved through time travel, but it still stands out as one of the truly great episodes of any Trek series. The Enterprise-D encounters a spacial anomaly and the Enterprise-C, thought lost 22 years before, appears through the rift. Suddenly everything is different. The Enterprise-D is no longer a ship of exploration. It is a battleship. The families are gone replaced by troops. And the Federation has been in a bloody war with the Klingons for 20 years. This is one of those episodes where strong characters, a tight script and good acting evoke an emotional impact that is not often seen on television. Patrick Stewart and Jonathan Frakes both display a subtly different Picard and Riker on the batteship, both with stronger personalities, more opinionated, which clash more often. The true gem of course is the return of Tasha Yar. “Star Trek: The Next Generation” took a big step forward in world of television when it premiered in 1987. Sure there was a female doctor and ship’s counselor but that wasn’t stretching things particularly far. Tasha though was a different matter. She was the security officer and martial arts expert. How many TV shows or movies for that matter had a female action hero in 1987? It’s too bad that Denise Crosby decided to leave the show by the end of the first season so Tasha had to be killed off by an evil black ooze. Seeing Tasha Yar back on the bridge, if only in an alternate reality, is a real joy in “Yesterday’s Enterprise”. Seeing all the characters deal with the decision to send the Enterprise-C back through the anomaly and face certain death is probably the strongest point of the entire show—particularly with Tasha. Her decision to go with them so that she wouldn’t have a meaningless death (via evil black ooze) is one of those times where even the strongest viewer gets a little misty-eyed. If you haven’t seen this episode before, I would strongly encourage you to take a look. It’s truly a fine piece of television. And if you have, maybe it’s been a while. Maybe it’s time to enjoy it once again. Where’s Bones When You Need Him? Doohan, who lives in the Seattle suburb of Redmond, also has suffered for some time with Parkinson’s disease, diabetes and fibrosis, the latter due to chemical exposure during World War II when he was a soldier in the Canadian military…. Years ago when I found out that Ronald Reagan had Alzheimer’s, it didn’t really make an impression on me. And when he died a few weeks back, I have to admit I didn’t really care. But this is Scotty! Who’s going to keep the Enterprise running? There’s a great episode from Season 6 of “Star Trek: The Next Generation” called “Relics” where the Enterprise D (Picard’s Enterprise) finds Scotty trapped in a transporter buffer on a Federation ship that crashed into a Dyson Sphere 75 year earlier. Scotty comes to grips with the idea that his time is past and he has to leave the adventuring to the younger folks, but not before he has a chance to save the Enterprise from certain disaster one last time. There’s also a wonderful story that James tells in the “Trekkies” documentary about how he helped a suicidal fan work through her emotional problems. James, we’re all pulling for you. Alien Nazis. I Hate Alien Nazis. Well the third season of “Star Trek: Enterprise” has come to an end and we’re left wondering how Captain Archer escaped from the exploding Xindi weapon and wound up on what is apparantly 1940s Earth with an alien dressed up as a Nazi. That one came out completely from left field. Hopefully it’ll be a cool and interesting little mystery to solve at the start of Season 4. 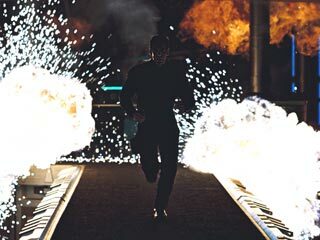 I was a bit disappointed to see yet another “action hero outruns the big explosion” scene. Please. This has to stop. I can’t even begin to count the number of movies and TV shows this is in. No more. Diving for cover: fine. Ducking around a corner or behind a solid object: fine. Running faster than an enormous fireball and shockwave: completely stupid and so over used that people should be ashamed to even think of including it in a storyline. Despite my aversion to that particular cliche, I’d rather watch an episode of any flavor of Star Trek then pretty much anything else on TV. Reality shows? Yeah, right. Sitcoms? No thanks. “Enterprise” can’t hold a candle to the all-time best Star Trek series ever, “Deep Space Nine”, but it’s still pretty good. They need more Jeffrey Combs though. I don’t care if he comes shows up playing Herbert West, Re-Animator. (Actually that might be kind of cool.) He was awesome as Inspector Brunt and Weyoun on “DS9”. He’s awesome as Shran. We just need more. Now I did notice a weird slip. Or maybe it’s not so weird. Maybe it’s a hint of what’s to come next season. When T’Pol made her entry in the Starlog as Acting Captain, she said the year was 2152. Not 2154 like it’s been all season long. Of course this could point to yet another reset button time traveling thing. And what a struggling show does not need is a “the whole last season was just a dream” story–or in this case meant nothing because time traveling made sure that whole thing never happened. Anyway, it’s was a pretty cool show though. It’ll be on again Sunday night if you missed it tonight. You can even catch up what happened this season over at the official Star Trek website. Yet again, Wil Wheaton has turned me on to something funny. According to BBSpot, Paramount is releasing Star Trek Service Pack 1 to fix all the errors in the original series. Maybe w3.org can work with the studio to come up with a strict validation for Enterprise. There’s another website of fan-created Star Trek episodes. These are done in the style of the original series and take place aboard the starship Exeter. I think it’s very cool that fans are taking the time to make these great shows. In other Trek news, startrek.com has a write-up of the Grand Slam convention that took place in Pasadena over the weekend. They talk very favorably about Wil Wheaton who has written about the experience on his own website. You might wonder why I write about Wil a lot. I don’t know the guy. Even though I probably live only about 10 miles from him and I’m a Star Trek fan, I’ve never met him. He’s kind of my hero. Wil’s a year or two older than I am. He went through his teenage years on screen at the same time I was going through mine in the real world. More recently watching those first few seasons of TNG again, I again saw myself at his age in the character of Wesley. Too smart for his own good and socially a little bit on the awkward side. It was his website more than anything that was the inspiration for my site. I’ve mentioned before that I have had or worked on various websites for ten years, but I’ve never done one that was so personal. The first website I made in college was a Mighty Mighty Bosstones fansite. Years later I did another band fansite for The Donnas. There was my writing for the RTC zine that had a bit of my personality in there, but mostly it was a fictional persona I hid behind. This is the first time I’ve come out and said, “This is me. This is who I am and what I’m thinking.” It’s a little frightening if I think about it too much. What’s With All These Enterprises? There have been many ships called Enterprise over the years. The opening credit sequence to “Star Trek: Enterprise” shows a few of them including the 19th century British warship H.M.S. Enterprize and the Space Shuttle test vehicle Enterprise. In the Star Trek universe, we’ve been introduced to seven different starships. The first Warp 5 ship is introduced in the TV show, “Star Trek: Enterprise.” In 2151, Captain Jonathan Archer, played by Scott Bakula, takes command of this ship. This is the classic ship of the original TV series. It is commanded by Captain James T. Kirk, played by William Shatner, during his original 5 year mission from 2263 to 2269. Its previous captain, Christopher Pike, played by Jeffrey Hunter, was introduced in the episode “The Menagerie”. The Enterprise-D is the ship seen in the TV series, “Star Trek: The Next Generation.” Captain Jean-Luc Picard, played by Patrick Stewart, is in command of the Enterprise-D from 2363 to 2371. This is a simple timeline for the Star Trek TV shows and movies to help new fans keep the events straight. There are many different timelines available on the web, including this extremely detailed one that includes the animated series, the books, and the comics. There are a lot of Star Trek fans out there. There are a lot of people who can talk about the minutiae of the various series. But I also suspect that there are people who are interested in Trek but might be a little afraid to “get into” it. There is a certain amount of geekiness that goes along with being a Trek fan, and that can be a little scary to new-comers. There is also a huge canon of material that makes up the Star Trek universe. Where do you start? How does it all fit together? How can you hope to make sense of something that has been established over decades? These are all things I would like to deal with here. Not in this entry. But eventually, in time, I’d like to compile a “Beginners Guide to Trek” or something along those lines. Let me just briefly mention that Star Trek (what is now known as The Original Series), the TV show with Captain Kirk and Spock, only ran for 3 seasons from 1966 to 1969. I’ve noticed that people who don’t really follow Trek are often quite surprised by this. It is pretty astonishing that a television show that was only on the air for 3 years could have such a huge impact on our culture. There are many shows that have lasted much longer: M.A.S.H., Cheers, Seinfeld–just to name a few. Do these shows have the same kind of impact? I don’t know. I do think it’s something to think about. In opening narration to the show, Captain Kirk says that the starship Enterprise is on a 5 year mission to explore strange new worlds. Obviously the original intension was for the show to last at least 5 seasons. Unfortunately it didn’t. There was an animated series that ran for 2 seasons in the mid-70s and featured the original cast contributing their voices. Together with the original show, you do get 5 years. However, there are people who feel that the animated series is not strictly “canon”. Since it was cartoons for kids it was subjected to stricter regulations that a primetime drama and therefore cannot truly be considered that last two years of Enterprise’s 5 year mission. There are some very enterprising fans who have decided to try to complete the 5 year mission. They have decided to create new episodes in the style of the original series with the original characters–though obviously not starring the original actors. They have a website where the New Voyages of the starship Enterprise can be seen.